It’s a truism in the medical world that the best guarantee of longevity is to be born to healthy parents. 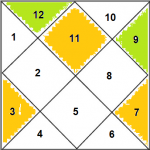 For those who take their health for granted, the next-most-desired aspect of a perfect life is to be born rich or, if that’s not possible, with a birth chart containing multiple wealth yogas. Although there are variations on the theme, a typical Dhana Yoga demands a combination of two planets involving (1) lord of a dharma house and (2) lord of a dhana house. 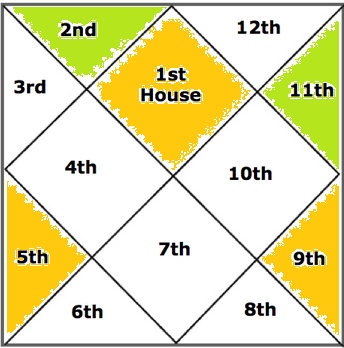 The dharma houses, associated with luck and good fortune, are the first, the fifth and the ninth. The dhana houses, associated with money, are the second and the eleventh. Combinations can be formed by either an association of the two requisite planets, or a mutual aspect. In the latter case, that’s usually from opposite signs; for Mars and Saturn, also when Saturn is four signs following Mars. 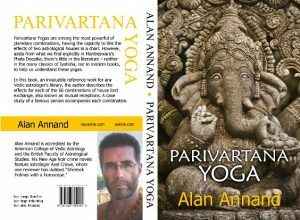 Given the simplicity of Dhana Yoga, one might assume all ascendants have an equal opportunity to form yogas among their dharma and dhana lords. But in reality, this isn’t so. Depending on the ascendant, it might be easier, more difficult, or downright impossible, for certain combinations to form. The simple reason is, not all planets enjoy unlimited freedom with respect to each other. Although all planets can associate with each other, not all planets are capable of mutually aspecting each other from opposite signs. Inferior planets are the proverbial flies in the ointment. Mercury can’t be more than 28 degrees from the Sun, Venus no more than 48 degrees. By extension of the same logic, Mercury and Venus can’t be more than (28+48=) 76 degrees apart. Therefore, if Dhana Yoga demands combined participation among the Sun, Mercury or Venus, they’re only capable of association, never of opposition. This changes the odds of forming Dhana Yoga for those ascendants where the Sun, Mercury and/or Venus are dharma or dhana lords. 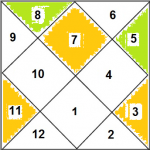 To illustrate this, let’s consider a Libra lagna chart, which has the greatest potential to form Dhana Yoga. The dharma lords of the 1st, 5th and 9th, respectively, are Venus, Saturn and Mercury. The dhana lords of the 2nd and 11th are Mars and the Sun. To form Dhana Yoga, Venus must combine with Mars or the Sun. Or Saturn must do so with Mars or the Sun. Or Mercury with Mars or the Sun. In the case of Venus, it enjoys unlimited freedom with respect to Mars, combining by association or opposing aspect from any two signs out of 12. But regarding the Sun, Venus can never be more than 48 degrees away. Therefore, it’s always found in the same sign, or in one of two signs on either side of the Sun, therefore, one chance in five of forming yoga. For Saturn, it’s completely free with respect to either Mars or the Sun. It forms associations or opposing aspects with both and, in the case of Mars, enjoys an additional opportunity for sambandha when Saturn is in the 4th sign from Mars, from which position they mutually aspect each other. Finally, regarding Mercury, it’s completely free with respect to Mars, forming associations or opposing aspects. But as an inferior planet, Mercury can never be more than 28 degrees from the Sun. It’s either in the same sign or in one of the signs adjacent, therefore one chance in three of forming yoga. For five ascendants – all of the earth signs and two of the water signs – one planet or another is both dharma lord and dhana lord. Since by definition of the term, yoga can’t be formed by a planet combining with itself, this diminishes for those ascendants the chances to form Dhana Yoga with the available planets. For Leo and Aquarius ascendants, Mercury or Jupiter, respectively, is the only dhana lord for that ascendant, ruling both the 2nd and 11th houses. This actually diminishes the odds for that ascendant to form Dhana Yoga. 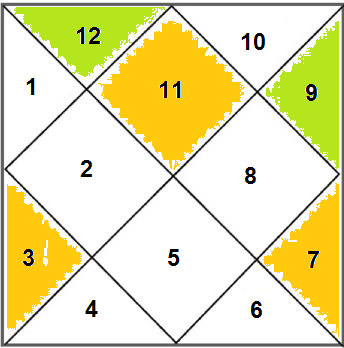 In the average chart, each of three dharma lords has the possibility of forming sambandha with one or the other of the two dhana lords. But in the case of these latter two ascendants, there is effectively only one dhana lord. If a dharma lord connects with that planet, it will thus form two Dhana Yogas, one with the 2nd lord, and one with the 11th lord. But that’s putting all one’s eggs in one basket. By having only one planet instead of two as dhana lord, that reduces the odds of the dharma lords making the requisite connection. 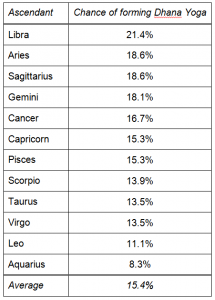 Let’s illustrate this with Aquarius lagna, which has the worst chances of all ascendants to form Dhana Yoga. Here the dharma lords are Saturn, Mercury and Venus, while Jupiter is the sole dhana lord, representing both the 2nd and 11th houses. Since Saturn, Mercury and Venus enjoy unlimited freedom of movement with respect to Jupiter, each has two signs out of 12 wherein sambandha via association or mutual aspect is possible. For every such valid contact, two Dhana Yogas are formed – one with Jupiter as 2nd lord, the other with Jupiter acting as 11th lord. But there it ends. The fact remains that the dharma lords have only one dhana lord with which yoga can be formed. For an analogy, consider the popular Vegas card game of blackjack, wherein the initial two-card deal of an ace along with a ten or any face card could deliver the perfect hand. But remove just one ace from the deck, and the odds of being dealt that winning hand drop immediately. Admittedly, life is not a game of cards but, in the realm of astrological yogas, chance still plays a remarkable role. Unless, of course, it’s just your good karma.